Even Coco Chanel was a fan of scarf turned headband. She poses here with Serge Lifar, one of the greatest male ballet dancers of the 20th century. 1937. Strathmore Showcases Artworks by National Association of Women Artists. So, Rise Up and Go See It! Strathmore Mansion in Rockville, Maryland, is indeed a great cultural center. I have attended many of their art exhibitions and the latest one just adds to the array of wonderfully curated shows. Strathmore collaborated with the National Association of Woman Artists (NAWA) and put on a juried exhibition called "Rise Up". As a textile designer, I am constantly looking out for interesting textures and color schemes. This show, thought it does not have any textiles, is still a wonderful resource. The colors in many of the art works are intense and prompt me to test out new media and color combinations. Or, as you see below from the three art works inspired by dance, we can also learn about brush strokes and their effect on the paper or canvas. Aren't these just breath-taking? As you stroll through the exhibition halls, you will end up at a delightful status of a dancing pig. Because why not? So joyful! So, make your way to Strathmore Mansion and enjoy this important exhibition honoring women in the arts (it closes on November 6, 2016). Many pieces are for sale and you may just end up with a lovely piece of art for your home! 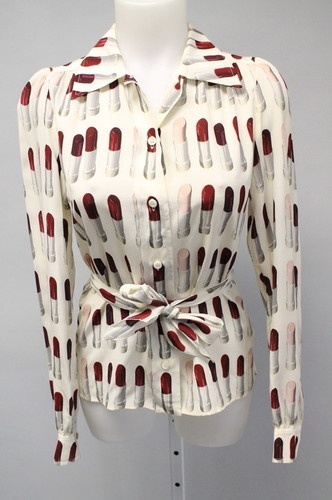 Red and pink lipstick print blouse by Miuccia Prada. Summer 2000. The Smithsonian is a world-wide known art and culture institution. I am fortunate to live near Washington D.C. and can hop on the metro and enjoy the Smithsonian museums and galleries whenever I feel like it. I am an art aficionado and often venture into town to see thee latest in the art world. My textile design work is inspired by what I see around me: architecture, nature, scenes captured through painting and photography. On a visit to the Smithsonian American Art Museum I snapped a photo of the ceiling at the Robert and Arlene Kogod Courtyard. I believe in looking up and the beauty of this ceiling took my breath away. I turned it into a textile design, which I then turned into an infinity scarf. A lovely architectural gem turned art for your neck! And how wonderful that this scarf is now available at the gift shop at the American Art Museum! Not only is my Ceiling scarf on display, but you will see six additional designs featured at the shop. Take a look below at the variety of my textile work. It's my pleasure and honor to bring the beauty of our world to you in the form of infinity scarves that bring attention to any outfits of yours. Most importantly, they bring joy to your day. And that's my goal. Joy is my favorite word and the Czech word for joy, RADOST, is the name of my company. I keep searching for all of the various meanings of this word and work to capture them in my work. And to tell the truth, when I walked into the gift shop at the museum and saw my design work on display, I learned about joy even more! I am proud and honored to be sharing it with you! Living in the city center? That's not stopping this gardener! Prague, Czech Republic. Photo taken in August 2016. Credit: Martina Sestakova. Python print dresses by Diane von Furstenberg. 2014. Black and white is an overwhelmingly popular color combination in fashion. I love it. It goes with anything and everything. Yet, it's kind of fun to explore the many shades of these two colors. I did so in my Photography Collection of infinity scarves. Let's take a look. The photo on the left is one of the ceiling at the Smithsonian American Art Museum. The metal rods form beautiful waves above you and as you look up, they won't let you just look away. The scarf designed using this photo is now for sale at the Museum gift shop. 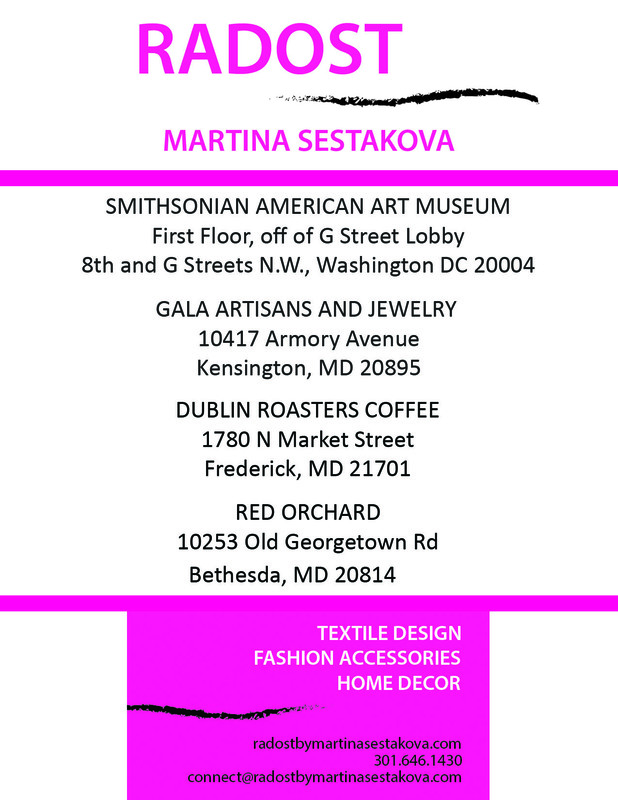 If you are in Washington D.C., stop by. The middle photo is a close up of a pine cone I stumbled upon during a walk in Prague, my home town in the Czech Republic. Aren't the shadows just mesmerizing? They add so much texture. Again, a lovely detail to use in a fabric design. Lastly, the photo on the right is one I snapped after a storm in Costa Rica. This one rain drop ... it added magic to a banana leaf. What do you think? Isn't there more to black and white then just them being black and white? My Photography Collection infinity scarves are perfect for any outfit. Shop them online here (free shipping in the US) or stop at these locations. The prettiest of pinks. Stockholm, Sweden. 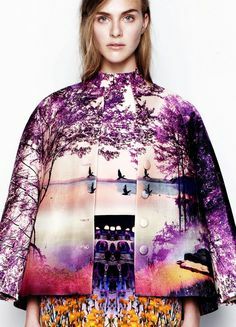 Striking photography-based textiles in Mary Katrantzou's Resort 2014 collection. Nature Picked the Color Scheme for This Textile Collection! Take a look at this lively textile collection: it's filled with much joy as I love the quiet when colors filled up the blank page and the excitement of receiving my fabrics in the mail. The left column provides you with my inspiration photos, the middle showcases my painting, and the right is the collection itself. I am like a little kid (yes, I almost jump up and down when my fabrics arrive): textile design is magic to me. My brand is called RADOST (the Czech word for joy) and indeed it is all about sharing my joy of life with others who get to add color and texture to their outfits. And in this collection I honor the beauty nature gives us all year round. Enjoy! The end of the day. Gamla Stan, Stockholm, Sweden. Fun, colorful floral prints as seen at the New York Fashion Week runway show by Anna Sui. 2016.